April 12, 2019 By Jeff Hall & filed under All Articles, Other, Weapons. Left to right: .308 150-grain GMX, .308 155-grain A-Max, .30-06 180-grain Nosler, and .300 Win Mag 165-grain GMX. In July 1874, Lt. Col. George Armstrong Custer led an expedition into the Black Hills, Dakota Territory with the goals of finding a location for a fort, a route to the west, and gold. The Black Hills, sacred to the Lakota (Sioux) people, were promised as “Indian Country” by the 1868 Laramie Treaty, so the Sioux were really pissed. Gold was found, which led to a gold rush, Deadwood, Calamity Jane, and the death of Wild Bill Hickok. The Sioux never forgave Custer, and they got big-time payback two years later at the Little Big Horn. There is still gold in the Black Hills, but of different origin. Black Hills Ammunition has been in business since 1988, evolving from Black Hills Shooting Supplies. Jeff and Kristi Hoffman set out to build world-class ammunition and have resoundingly accomplished the mission. Training is rigorous, and it takes two to four years for a new employee to begin any part of the loading process, after time in inspecting or packaging. Every round, 100% of the ammunition, is inspected by hand, and it takes five weeks of one-on-one training before an inspector is cut loose. Inspection continues at all levels, constantly, and the code on each box will tell who/what/where/when any defect occurred. Black Hills’ quality control, as expected for premium ammunition, may be the best in the industry. I’ve been a Black Hills Ammo fan for years, often shooting their 168-grain Match .308 on my trips to Thunder Ranch. The ammo is consistently very accurate and reliable, and I have yet to see over pressure or a bad primer. 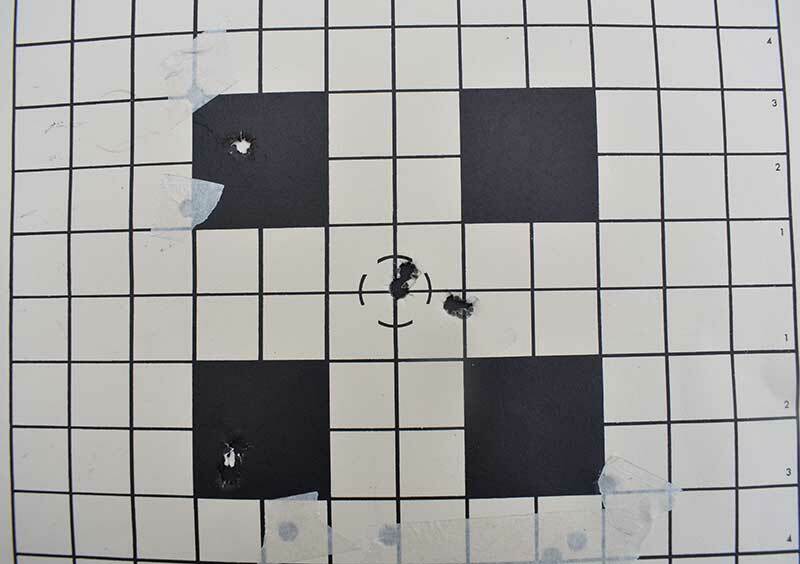 I shot a 1/8-inch group from a plain Colt 6920, using Black Hills 69-grain Match. I’ve also shot thousands of rounds of .380, 9mm, .45, 5.56, .357, and .44 Magnum, just about everything they make, and have never been disappointed. Clockwise from top left: .30-06, .308 150-grain, .308 155-grain, and .300 WM. I recently got a chance to evaluate some new additions to BH’s Gold line of hunting ammunition. This match-grade ammunition comes in numerous rifle calibers (.22-250 to .338 Lapua) and bullet weights and is designed for optimal hunting performance. The bullets selected for each load come from Hornady, Nosler, and other top producers. I opted to try the .308, .30-06, and .300 Winchester Magnum. I have rifles in each caliber and wanted to see how the new loads performed. I started with the .308. The rifle is my old sniper rifle, which I’ve had for 30 years. It started as an off-the-rack Remington 700 Varmint with gloss blue finish, walnut stock, and 3X9 Leupold scope. It morphed into a Magpul-stocked, magazine-fed, GSL-suppressed tack driver, fitted with a 3.5X10 Leupold scope. It is the one rifle I’ll always have for dedicated accuracy work. The only problem with the 168-Sierra boat-tail bullet is its performance on living things—it has a reputation as being less effective than a hunting bullet. My understanding is that the bullet is designed primarily to cut clean holes in paper, not big, deep holes in critters. I once hit a bull moose in the center chest at about 75 yards with Federal 168 Match. He dropped, then got up and ran, requiring two more hits to stop him. 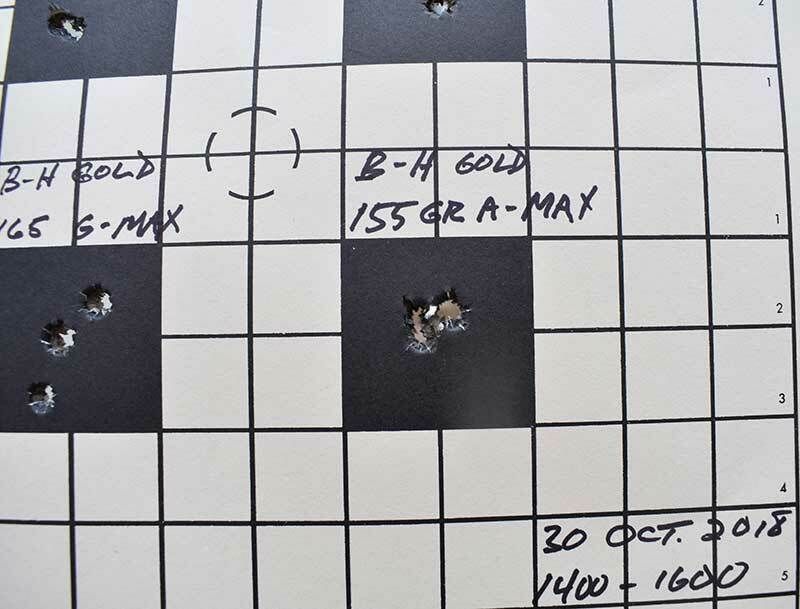 The first load provided was the .308 Win Match loaded with a 150-grain Hornady GMX bullet. Stated velocity is 2,750 feet-per-second (fps), energy is 2,518 foot pounds—more than enough for anything in North America except big bears. I have a stockpile of 150-grain soft points from several manufacturers in case I want to hunt local game. I decided to test the Gold round against a standard hunting load from another manufacturer. Test day was overcast with no wind. I shot from 1,400 to 1,600 before the wind picked up. It was about 45 degrees, and range to the target was 102 yards. I shot from my bench, fore and aft of the rifle on a rest, and sandbagged. I know, you don’t get to do that in the woods—I was only after accuracy. I verified my 100-yard zero with 168-grain Match and re-zeroed for each load. I fired three, three-shot groups, letting the rifle cool a little between strings. I wasn’t surprised with the accuracy. 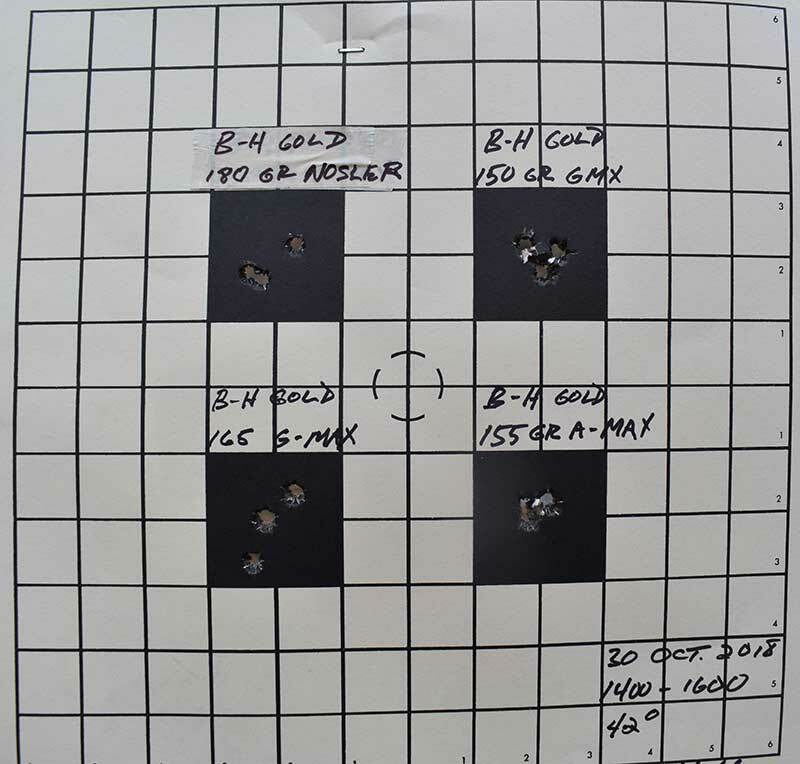 My final group was just less than one inch, nicely grouped in the center, and half the size of the competitor’s group. Author’s rifle loved 155-grain A-Max. I then fired the 155-grain load, with the Hornady A-Max bullet. My rifle really liked this load, turning a half-MOA group into one ragged hole. It was interesting how little both loads varied from the Black Hills 168-grain load I normally shoot. The next rifle was my old .30-06, which I mentioned in an earlier article about bolt-action rifles. My dad put it together in 1946 on a surplus $7.00 Springfield Model 1903. I had it re-blued years ago, refinished the stock, added a Timney trigger, and upgraded the glass to a 3X9 Leupold. That rifle has killed more animals than the bubonic plague and still shoots well, and every man should have a rifle in ‘06. The rifle was zeroed for Remington 180-grain soft points, so I re-zeroed with the Black Hills load. The bullets were the same weight, though the Black Hills load uses the 180-grain Nosler. I was having a minute-of-Jeff string, with nothing coming together. My final string had the first two rounds overlapping. I must have relaxed a bit, as the third round was half an inch high and right. Still, I was happy with the group, which was better than the usual groups with my normal load. First .300 Win Mag cold-bore shot was low and right, two dead center, fourth round minute-of-Jeff, on top of the first. My primary hunting rifle in Alaska was a Remington 700 in .300 Win Mag. I tried .338s, .375s, and a .458 before I settled on the .300. It has good range, great energy, is accurate, and doesn’t beat the snot out of me with each shot. The rifle is equipped with a 6X Kahles scope, the only European glass I own, but it seems to transmit more light in low-light conditions. My longest shot at anything living was with this gun: a 335-yard downhill shot at an elk in British Columbia. I put one round behind the shoulder, the elk took a single step, and the hunt was over. I normally shoot a 180-grain Nosler, but two of my friends swear by the 165-grain, claiming it’s a little flatter and reaches out farther. I fired one cold-bore shot, which was a little low and right. The next two touched, dead center, then the fourth overlapped the first. I spent a few minutes making adjustments, fired over 20 rounds, then went for a group. I may have been a little recoil shy at that point, as my next group was about 1.5 inches. I know the gun and the cartridge will do better, and I have a few rounds left, so I’ll try it again when I’m not flinching. I liked the 155-grain Gold A-Max load so well that I’m going to re-zero my Remington M700. I carry this gun a lot—short, light and fast-handling. I’ve been shooting the Federal 165-grain tactical through it, but the performance of this load, combined with a superior bullet, will make it a great all-around bolt gun. If you do your part, the Black Hills Gold cartridge, in any caliber, will do its part. Jeff Hall is an Army veteran, retired Alaska State Trooper lieutenant, and NRA staff instructor. He also teaches for several state POST agencies. He is a martial arts grandmaster and founder of Hojutsu-Ryu, the martial art of shooting. He can be reached at soke@hojutsu.com.